Edinbugh University People & Planet with supporters in the Old College quad, March 2016. Credit: Ed P&P. 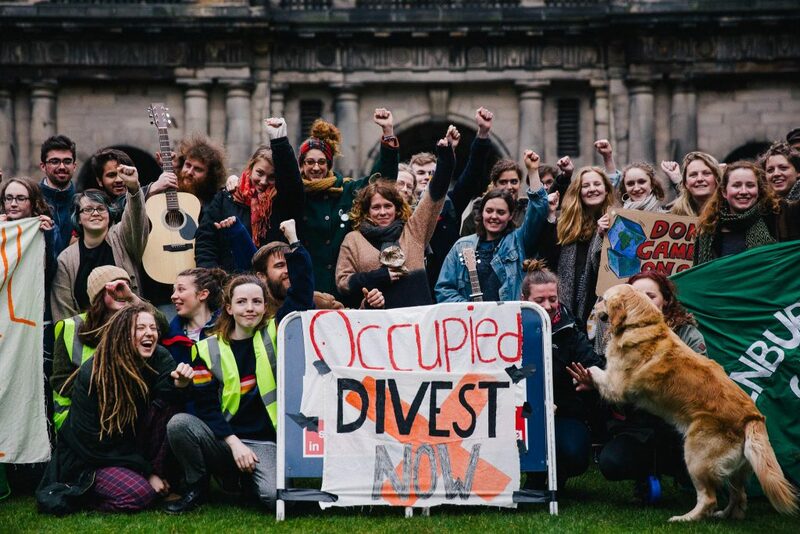 After six years of campaigning led by student group People & Planet, and drawing in the efforts of staff, alumni and numerous University bodies and departments and Scottish civil society, the University of Edinburgh has finally agreed to fully divest from fossil fuels. On Monday 5 February 2018 the University announced it would “complete its transition out of fossil fuel investments within three years”. They claimed to hold funds under management of over £1 billion, making this the largest university endowment fund to be exiting fossil fuels to date. The campaign to divest Edinburgh University was launched in January 2013 when the University had a multi-million pound stake in fossil fuels. People & Planet UK and 350 chose to launch their ‘Fossil Free UK’ campaign in Edinburgh in October 2013, giving an early boost. Motions were passed to gain the support of the Students Association, events and talks hosted, and 1,192 names collected on a petition for “a robust responsible investment policy that screens out fossil fuels and the arms trade, and makes the investment process more responsible, accountable and democratic.” In October 2014, Glasgow University became the first University in Europe to commit to divestment, putting more pressure on Edinburgh to act. The University, pushed by then Rector Peter McColl, formed a special group to reform their investment policy, but campaigners were deeply unsatisfied with its progress. Matters came to a head in May 2015 when a new policy was unveiled with no specific exclusions for fossil fuels. Students rushed to occupy the Finance Office and ended up staying for an incredible 10-days, hosting a stream of visitors including nobel prize winner Graciela Chichilnisky. 300 alumni signed a petition to withold individual donations from the University. The sit-in was constantly in the news causing considerable embarassment to the University, who eventually responded by committing to a divestment from some of the most polluting fossil fuels of coal and tar sands. Despite this milestone, students did not let up, and continued to protest, camping outside the Principal’s Office in March 2016 and occupying the Finance Department again in April. Throughout 2017 they continued to negotiate with the University and organise under the banner ‘Divest The Rest’. The University responded by touting its investments in green technology, but stood by their refusal to divest from oil and gas. Last week’s announcement changes all that, putting Edinburgh University ahead of most others in its efforts to invest for the climate. 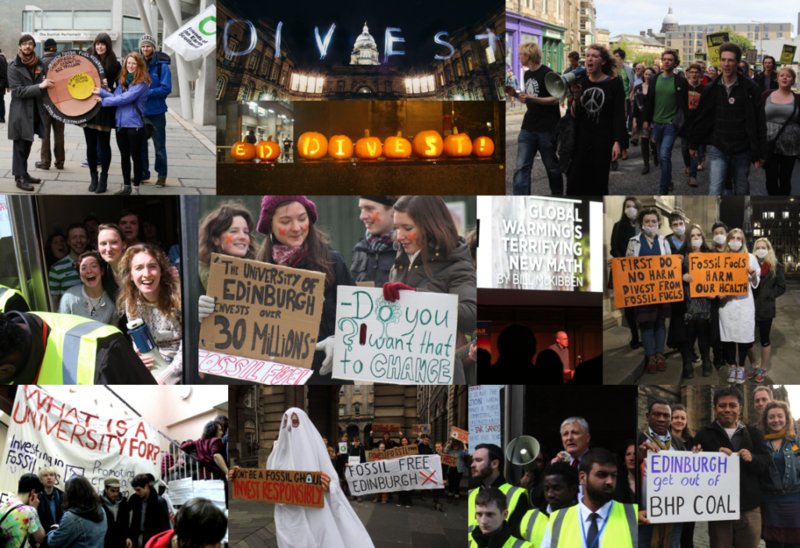 Five years of campaigning for Edinburgh University to divest. Credit: Edinburgh P&P, FOES and Ric Lander. There are now more than 60 UK universities which have fully divested from fossil fuels, as well as other influential bodies such as the New York City pension fund earlier this year. It is hoped that the University of Edinburgh’s decision will influence others to follow suit, such as Edinburgh Council, which currently invests over £100 million in fossil fuels through its pension fund. Campaigners anticipate that this positive outcome will inspire other student activists across the country by showing that, through sustained and organised student pressure, universities can be changed for the better. This post was written by Ruby Kelman and People & Planet Society with additional text by Ric Lander. This is wonderful news. Thank you to all who have worked for this. May Edinburgh Council follow suit!! !